Senator Nelson from Florida has filed a restrictive bill that would stifle innovation and experimentation, without impacting terrorists or criminals. Interestingly, a complete exemption would be included for the U.S. government and agencies. The bill is titled the “Undetectable Firearms Modernization Act of 2017“. I would like to see Senator Nelson back up his claim with a demonstration. Even the plastic replica found at the Reno airport, was detected because of the metal in the *ammunition*. Even Defense Distributed used a metal firing pin in the design of its “Liberator” pistol. Senator Nelson cited the non-firing replica from Reno in his announcement. Both lawmakers cite an August incident where TSA Agents at the Reno-Tahoe International Airport found and confiscated a plastic gun from a passenger’s carry-on bag during screening. 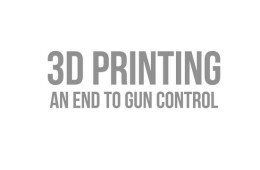 The gun, assembled using a 3-D printer, was found loaded with five live .22 caliber bullets. One of 68 firearms discovered in carry-on bags nationally the week ending August 4, 2016, the TSA says it was a realistic replica, loaded with live ammunition. The TSA says the passenger was offered the option of checking the item in carry-on baggage, but chose to leave it behind. The passenger was not arrested or cited, and continued to his flight with no impact to airport operations. Nelson and Schumer’s statement was made in March of 2017. If you remove *all parts* other than a major component, only a major component is left to detect. Words mean things in the law, and the phrase in bold is not equivalent to “all parts other than all major components”, even though the difference is only two letters. Such a requirement would outlaw all composite frames on the market today. Glock frames and most Glock type frames would be outlawed. Virtually all composite AR type lower receivers would be outlawed. The law could either be a sneak attack or simply a result of ignorance on the part of Senator Nelson and the other famously anti-Second Amendment co-sponsors. It will be interesting to see if Senator Nelson uses images of the non-firing replica from Reno to bolster his bill. It seems unlikely that Nelson’s bill will find much support in a Trump administration with a Republican Congress. Editor’s Note: Why the chances of such a measure passing in regards to so called undetectable the near future at a federal level are about nil it is important to remember that that only remains true while pro gun Senators are in the majority of the Senate. And even that is not the case, so long as a pro gun President can veto it the chances that such a infringing bill ever becoming law is minute at best. This DOESN’T mean however that individual states such as California and New York won’t seek to further erode the liberties of their citizens by passing such measure on the state level. With luck over the next four years the balance in the Supreme Court will shift ever more to the understanding of the Founder’s intent on what “shall not be infringed” actual means and thus deny the rights of the states that would violate the Constitution. On a personal note, I am completely fine with so called undetectable firearms because if the government can’t detect them then they can’t confiscate them. And if things ever go sideways I want as many of my guns to be undetectable as possible.